Yawn if you want to slow down! “Fairy Godmother” type cars are looming with the invention of the “yawn detector”. Are these devices vital assets pacifying police and making roads safer? Or unnecessary accessories that state the obvious? Cruising gently at 48 miles per hour down a 50 mph dual carriageway in Lancashire, 29-year-old Susanna Jackson did not believe she was breaking any laws as she returned home in rush hour after a grueling 10-hour shift on her feet. The veterinary nurse was therefore understandably surprised when she was pulled over by police at traffic lights for committing the most sinful of felonies – yawning. Being uncouthly and persistently asked if the reasons to her clear “fatigue” were because she had been drinking or taking drugs, Miss Jackson’s already long and tiring day was made significantly longer as she spent 20 minutes showing two police officers her vehicle and identity documents, whilst another coarsely scrutinized her car for any incriminating “evidence”. The young nurse was justifiably upset and somewhat offended by what she describes as “incrimination”. “They kept asking me why I was yawning and weren’t interested when I said I had been working for 10 hours and was tired. When I was finally allowed to drive away, I felt like I was a criminal. It was very embarrassing,” Miss Jackson told RT. Feeling drowsy whilst being behind the wheel is an affliction that probably all motorists have endured at some point. Although driving whilst being tired is undoubtedly dangerous, it is not a criminal offence, and therefore regulating or implementing any laws or strategies to control it is difficult. According to the US National Highway Traffic Safety Administration, people being tired at the wheel cause an estimated 100,000 road accidents in the US each year. “Human fatigue has been a persistent factor in far too many transportation accidents,” says the National Transportation Safety Board (NTSB). In order to reduce significantly the number of fatigue-related accidents, it is the NTSB’s aim to deploy new strategies and technologies designed to assist tired drivers. Engineers from Mercedes-Benz have introduced various safety systems intended to help fatigued drivers, like the Electronic Stability Program and Brake Assist, both of which have contributed to the reduction of road accidents. Although extensive research has been carried out to understand and recognize the biological changes of drivers experiencing fatigue, most previous methods are expensive and have been perceived as unrealistic. Connecting drivers to an electro-cardiogram machine to analyze heart and brain activity has been considered, but would be impractical and costly. Scientists from India and America believe they have the answer by the means of an in-car “yawn-detector” system, said to be a cost-effective and convenient method in the prevention of accidents caused by motorists being tired. Aurobinda Mishra from Vanderbilt University in Nashville has been working alongside Mihir Mohanty and colleagues in West Bengal, and has developed image-processing software, which is placed inside the car and can detect a driver yawning by analyzing a series of facial expressions. 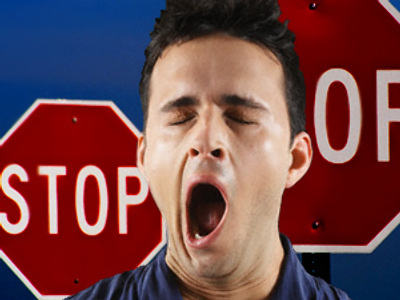 When a yawn has been accurately identified it then triggers a warning signal to alert drivers to take a break or slow down. Although “slowing a driver down” is not the only potential asset of a device that can detect tiredness. If systems like the “yawn detector” were commonly fitted into vehicles, traffic police may not be as intent on harassing motorists for doing something as innocent as yawning. Although Susanna Jackson is usually indifferent to gadgets like sat-navs, since her recent ordeal at the traffic lights, she would welcome a yawn detector system, if not only to appease the police. The very nature of tiredness makes it hard to prove whether a driver being fatigued has caused an accident. Because of this ambiguity, road safety experts believe fatalities caused by tired drivers are likely to be much higher than the statistics show. Installing features that may prevent deaths – however ambiguous – has to be an important aim. Transforming a car into a “fairy godmother” that “waves a magic wand” to impede fatigue may prove to be, for some drivers, a little annoying. Although maybe not as annoying as a haughty police officer unfairly delaying innocent motorists from getting home after a hard day at work.